Over 55,000 people have indicated that they will attend a protest march so Alexis Sanchez breaks up with his girlfriend–in order to regain his form. 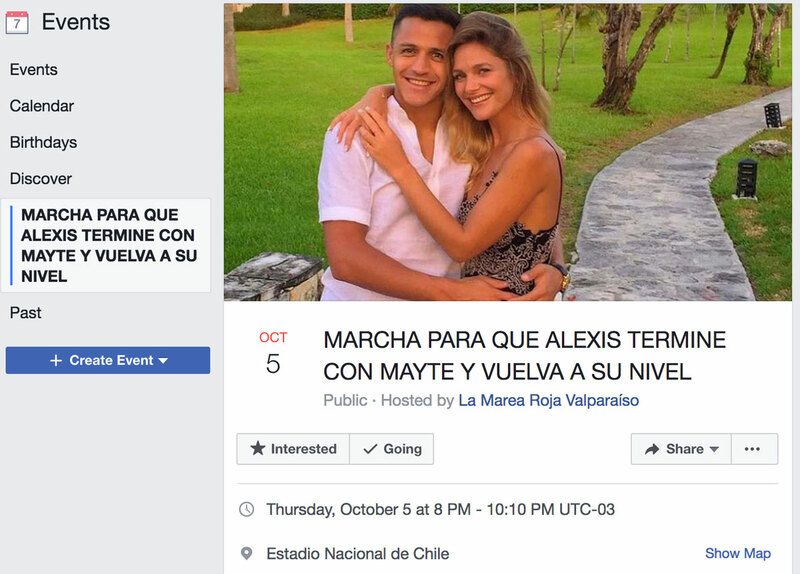 Over 55,000 people have indicated that they will attend a protest march with the intention of getting Arsenal and Chile star Alexis Sanchez to break up with his current girlfriend Mayte Rodriguez in order to regain his form. The public Facebook event - which promises a march to the national stadium in Santiago on October 5 - organised by Chile fan group 'La Marea Roja Valparaiso' has gathered attention for the sheer volume of respondents, with a further 70,000 marked down as 'interested'. The title of the event translates as: "March to get Alexis to finish with Mayte and return to his level." Rodriguez, a 28-year-old model, became publicly known as Sanchez's new girlfriend after the Confederations Cup this summer, and is now being used as a scapegoat for her boyfriend's lackluster displays in the national shirt. While revered in the Premier League, Sanchez has received criticism at international level recently - most notably after defeat to Bolivia when former youth coach Jose Sulantay described Sanchez as looking "fatter than normal." After defeat in both of their last two matches, Sanchez's Chile sit sixth in the South America qualifying table and could miss out on the World Cup 2018 in Russia, unless they can get results against Ecuador and Brazil in their final group games next month. Bizarrely this is not the first time Sanchez has been the subject of protests in his home country. Back in March, over 14,000 signed up to a march demanding the star left Arsenal. However, famously only five people showed up.